#3DPrintShow – 3D Printshow:INSPIRE Fashion Show #3DxFashion #3DThursday #3DPrinting #3dpsNYC « Adafruit Industries – Makers, hackers, artists, designers and engineers! In 2012, we hosted the world’s first ever 3D printed fashion show.In 2013, the show evolved, mixing fashion, dance and live music at our London and Paris shows. 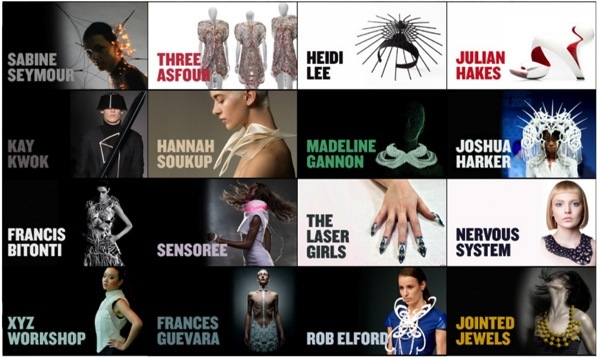 For New York 2014, we’ve created a new interactive experience, bringing together some of the world’s top fashion designers and artists working in the realm of wearable 3D printed design. Each of our pieces represents the most cutting-edge creative techniques being explored today. Showcasing the most exciting and progressive designers at the show, our line up includes: Francis Bitonti, Bradley Rothernberg, Joshua Harker, Dorry Hsu, Pia Hinze, Kristin Neidlinger, Madeline Gannon, Kay Kwok and Pia Hinze and more…. The Adafruit Learning System has dozens of great tools to get you well on your way to creating incredible works of engineering, interactive art, and design with your 3D printer! We also offer the MakerBot Digitizer in our store. If you’ve made a cool project that combines 3D printing and electronics, be sure to let us know, and we’ll feature it here!